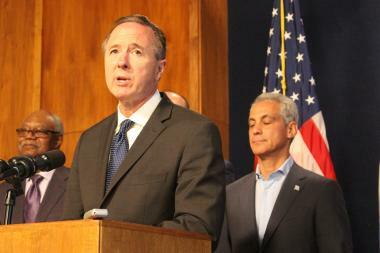 CPS CEO Forrest Claypool insists the testing is being done out of "an abundance of caution." THE LOOP — Chicago Public Schools added eight new schools to the list of those that have tested positive for lead in the water Friday, bringing the total to 43 since testing began. The new schools added to the list Friday included Darwin, Deneen, Disney II, Funston, Goudy, Penn, Smyth and Solomon. The previous count, released Tuesday, found 35 schools tested positive for lead in the water. CPS said Friday that families at the schools had been notified. Many of the positive tests released Friday came from sinks, not fountains, and the district has insisted that "generally, it seems that many of these fixtures with readings above action level may not be in frequent use." Following the lead-poisoning disaster in Flint, Mich., CPS began looking into lead in the water of schools this spring, and first detected it at Tanner Elementary in May. CPS Chief Executive Officer Forrest Claypool said at the time that all schools would be tested out of "an abundance of caution." Some 134 schools have now been tested, starting with the more than 250 built before new lead-pipe regulations took effect in 1986. The district said more information can be found, including test results, at its own website on lead testing.